It doesn’t matter where you live. There’s no way to escape bad weather at some point during the year when you live in the United States. And if you have a wooden fence or deck railing, the weather is one factor that’s going to hasten its demise. Our 6x6 copper post cap will help you protect your posts, extend the life of your fence, deck or porch railing, and add a decorative element that will give your fence a more elegant and sophisticated look and feel. What’s more, the dramatic impact a copper post cap will have on your landscape, and overall curb appeal is undeniable. A simple installation of two screws in pre-drilled inserts on the side of each cap. Copper powder coated aluminum will outlast any wood product! 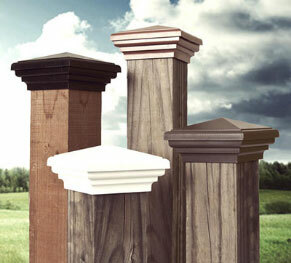 The low profile aluminum post cap is a utility cap that comes in a pyramid style. The post cap gets its color from the powder coating treatment it gets during manufacturing. We like this product because of its simplicity and versatility. Its design is minimal, and that’s a good thing when you don’t want a copper post cap to draw attention away from the fence or the rest of the property. The 6x6 copper post cap comes in two sizes: Nominal and Actual. The lumber industry standardized these terms to distinguish between wood that is cut when it’s still green (undried,) and wood that is dried before it is cut to size. When wood is cut first, after drying and undergoing the finishing touches, it’s half an inch smaller than it was immediately after the cut. Actual wood is true to size. So a 6” x 6” post that has a tag or label that specifies that it is an actual or true post, it’s exact measurements will be 6” x 6”. A 6” x 6” post that is nominal is really a 5.5” x 5.5” post. An aluminum post cap is much stronger and more durable than a wooden one. It will protect the top part of your fence posts from moisture that may cause wood to get moldy or rot. And it will probably outlast your fence. Every copper fence post cap is easy to install. There are two pre-drilled holes on the side of the topper, and all you have to do to secure the 6x6 copper post cap to the post each screw in the hole and drill it into the wood. Two screws ensure that your aluminum post cap is permanently affixed to the top of the post.